If you are an artist interested in selling art online, I’ve written a new eBook that will help get your marketing efforts on solid ground. It’s not a how-to book, but rather a what-to-do book. It’s short: 40 pages of easy to understand information, concisely written, on what to do, what it means and how it works. an indispensable tool for artists who are new to online marketing. a no-nonsense road-map for skilled web professionals looking to supercharge their online efforts. Within minutes (literally!) you’ll know what needs to be done and how you need to proceed. You’ll understand how your website, blog, mailing list, backlinks and social media all work together to build a strong sales and marketing presence. Here’s the deal: it’s free. Download it here or click on the button below. I hope you find it useful and welcome your feedback. You may send it to every artist, fine art photographer, jeweler, sculptor and gallery owner who needs to read it. You may tweet it, email it, link to it here and even post it on your own site or blog. Cheers! Thank you, Lyn. Best wishes! A wonderful resource for free online marketing! Thanks for commenting, Lara, and for the tweet. Good luck to you. thank you for the ebook it will be a great help. It is a great source for internet marketing. I love it. I’m glad you are enjoying it, Pamela; please keep in touch with your progress. Thank you for the ebook it will be a great source of information help. Wishing you all the best, Dessie! Great eBook Dan. Most helpful relevant and current advise on the subject. This eBook is also a great way to help others while helping yourself at the same time. Great work! Much appreciated, Arthur, thanks for commenting. Hey! Your logo avatar would look great as your comment-posting Gravatar. I appreciate you downloading the 7 Keys and commenting, Leana. Good luck with your art sales! Dan, Thanks for writing, producing and sharing this valuable information. It’s great stuff. I plan to implement and share. My pleasure, Brennen, I hope it helps. Your work is outstanding, BTW. Dan, thanks for sharing. I will definitely be sharing your ebook with other artist friends. Love your work, will connect with you on FB. I look forward to it, Deborah. Thanks for your comment! Thank you Dan for your generous sharing. Very informative and easy to understand info…a lot of common sense, but as you mention “burn out” happens and frustration sets in with the business end of marketing myself. I’ve added your specific advice in my notebook and WILL follow through. Amy, I look forward to following your progress. Building an online presence can take time, but even your small efforts are cumulative. As I say, a thousand little nudges will ultimately drive purchasing. Wishing you all the best! thank amigo its very hard to live as an artist thanks for you time. Angel, my friend! Thank you for stopping by. YES it’s often hard to live as an artist but we can do it! Best wishes. Super-good, Laura! I appreciate your comment and wish you the very best. I want to thank you for this important information. I will be starting off from square 1 so this e book is extremely helpful. One step at a time, DM. Pretty soon you’ll be a marketing machine. Good luck! I’m reading this again because it is just so good! You covered everything and any artist who follows through on your advice could experience success! Thanks again, Dan! Gayle, thank you so much for helping spread the word; your art has always been an inspiration to me. Good luck with your promotions. Thank you! So many great suggestions. I really like the one step at a time approach and will pass it on. Just discovered you and really like your e-book. Thank you for sharing it. Hi Dan, just stumbled on your article, it is basic, simple and easy to follow…I love it ! I have a question, how do you feel about selling prints through a POD site and is this a good way to generate traffic to your own website? Thanks, Christine. A quality POD is a great way to sell your work. Plus, they handle the matting, framing and shipping. You can link images from your site directly to the POD purchase page. Some traffic will come your way from the POD site, but don’t count on that. Traffic will mostly flow from your site to the POD. Use the Keys in my eBook to generate as much traffic to your site as you can. That’s your center. Hi Dan. I found your website through FAA and I’m really impressed–not just with your work but with your generosity. Thank you so much for sharing your experience. I’m looking forward to reading your book and then taking the time to implement your advice. My pleasure, Bernice — here’s to your success. If you have questions just drop me an email; I’ll do my best to point you in the right direction. Thank You for e book , I love it …..
A huge thank you for this! You’re welcome, Joann. Good luck with your marketing! A sense of humor is MOST useful in this and every other kind of weather, Jason! I totally enjoyed your review; good luck with your marketing. A great example of giving and receiving as a two-way street. Thanks, Kim. Incidentally, your work is beautiful! Thank you Dan for the ebook, very informative! You’re welcome, Randy. Best wishes! No website yet. Newly posting my artwork on FAA. Thank you for this PDF. I am doing all the research I can on selling art work on line for both my husband, James Fleming, (also on FAA) and myself. Have tried previously over the years with dismal results. Now that kids are grown I have more time to put into the effort of research first. Thank you, I appreciate all the time and effort you certainly have put into this project. And Thank you for sharing the information. I will pay it forward wherever and whenever I can. Thank you for your comment, Roberta. Remember that a little of the right marketing goes a long way. Small, consistent effort over time beats a marketing-filled weekend. Good luck to you! Thanks for the e-book, I found it very instructive. My best to you, too, Joyce. Thanks for your comment. Thanks for this, Dan. I’m sure I’ll be referring to the points in this book often in the future. Nicely designed – and easy to read. Well done! Thanks, Dennis; good luck with your art marketing! Thanks so much for providing this very valuable information Dan. I also love your work and as a fellow digital artist I find it especially heartening that you have achieved much success. All the Best to you! Excellent info Dan! Thank you so much for putting it out there!! Thanks so much for providing us starving artists with some free and helpful content!!! Thanks so much for making this free, it was a good read and helpful! Thank you so very much for sharing your knowledge! Thanks for allowing me the free download, it will help me sell more of my art. I seen your comment in the discussion and you had such great advice, thanks so much. Thanks guys, your comments are really appreciated. Good luck with your art sales this year! Thanks you for your generous words of wisdom! I just downloaded your eBook and I am so excited to read it so maybe I can educate myself a little better with online marketing (as I say all the time, “I’m an artist, not a business woman!”). I was wondering, what is your opinion of selling art on websites like Etsy? So far I have had a positive experience with the site and it gives me one-on-one interaction with my fans. The only downside is that the revenue side of it is so extremely sporadic. What are your thoughts on this website and those similar to it? Thanks for the generosity, it’s awesome someone is helping the artists out there and pushing us a little farther to defy the “Starving Artist” stereotype. Hello, i really apreciate what you share with us, im new in salling art and this infomation opened my eyes for a lot of things,thanck you very much for this helpful advices!!! Dan, thank you so much for sharing your art marketing wisdom! I found your e-book through the discussions on FAA. Solid advice and very helpful, cheers! Great article, thanks for sharing, at least I now know I’m on the right track. Very informative. I was looking for this exact info and downloaded immediately. You’ve shed some light on a couple subjects I’ve been struggling with for some time now. Thanks a lot. I’ll be sure to share this with my followers. 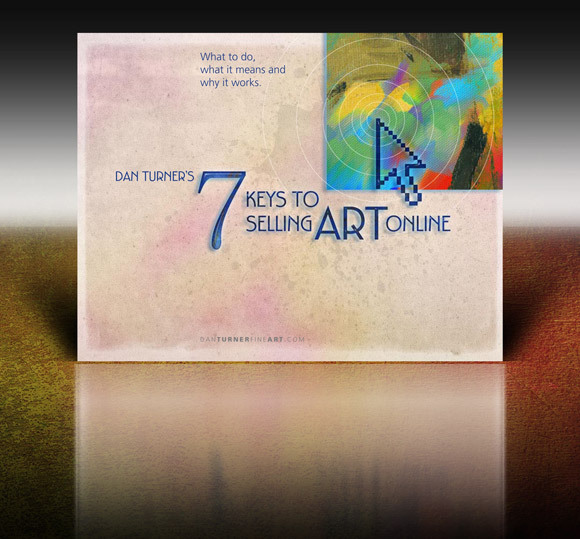 Rereading Mr. Turner’s Excellent ‘7 Keys to Selling ART Online’ yet again… a necessity when I need to kickstart my marketing strategy! Thanks for sharing your wisdom Dan! You’re welcome, Danielle. The fundamentals always pay off. Good luck with your marketing! Wow, thank you for the free e-book! I enjoyed reading it and found a lot of information on what I should be doing as an artist…I’ll definitely be referring back to it quite often as I go. Very well formatted and easy to read, btw! Anyways, I found your link from a discussion blog in Fine Art America…glad I checked it out! Thanks again for all the helpful advice! I see now that I have much work to do yet. Thank you for sharing your E-book. Learned a lot and will apply your suggestions.